Can I really cover a whole year in one post? Crazy Hair Day....when it took me longer than 30 seconds to do their hair. Best part of this picture is the marker on Tayrn's face. The marked incident happened in the morning and I don't even think she got changed out of her PJs that day. The only costume I had to think about this year was Macie's. The rest we either had or were borrowed. It made for an easy holiday that is for sure. I didn't even decorate my house. Marley is still mad about that one. We went to a White Trash Bash and had a great time. When I bought this one-piece camo suit at Goodwill a few years ago I knew it would come in handy. Such items are one of a kind and are not meant to be passed up. We Thelin's love Halloween. I think I have almost as many Halloween decorations as I do Christmas. Between carving pumpkins and dressing up, it may just be the "most wonderful time of year." Trenton first told us he wanted to be a princess. Yes, that is right. So after many prayers and the influence of his cousins, we talked him into Indiana Jones. The whip was the clincher. I am soon going to hide it since I don't like him trying to whip and grab, household objects anymore. He may look like Indy, but he doesn't have his skills...yet. This year, Taryn was a Skeleton and Dorothy. 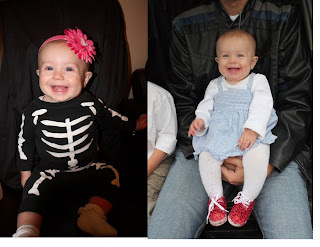 The skeleton costume is one I bought when Macie was first born. All my kids have worn it, so I had to keep the tradition. Taryn also work sparkly kicks rather than slippers. 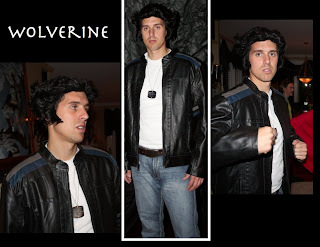 I took a modern twist to the costume. For those of you who don't know I am actually a super hero nut. My younger brother Nathan and I would watch the cartoons after school together. Most of my knowledge is in The X-Men and Batman series. 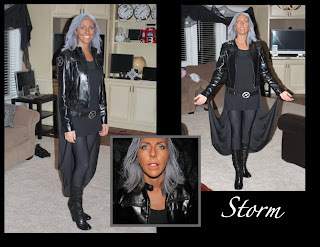 So for my costume I choose one of my favorite female superheros...Storm. My kids said I looked like an old lady. They apparently don't have the same appreciation for Storm that I do. It isn't just my family, but the extended family is just as into it as I am. 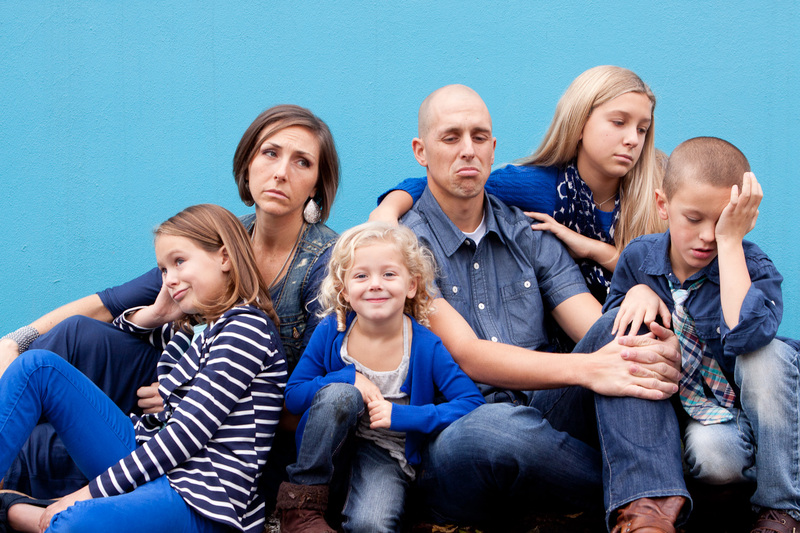 Here is the rest of my "super " family. From left to right...Clark Kent and Lois Lane, Wolverine and Storm, The Joker and Poison Ivy, Moonbeam and Nacho Libre. We are so cool! Hope everyone had a Happy Halloween, cause we sure did. It was virtually impossible to get everyone's mask on and have them all stay put. Grandma Thelin brilliantly hid money in a tennis ball. Trenton thought he was Jack Sparrow with his new found treasure. Dollar store, here we come! Yes, that is Justin. I know, some of you were fooled and thought it was Darth Vader. It is hard to have Muggles as children, when you, yourself are a witch. I guess they are actually "Squibs" (none magic people from magical parents) since Justin seems to be a wizard when it comes selling crane mats. Despite this genetic defect they seem to be very happy. No one seems to be able to get enough with our recent Muggle, Taryn. I can't put Taryn down without fearing for her life. She could potentially get mauled, dropped, dragged or fed goldfish from her loving siblings. So I continue to carry an extra 12 pounds around everywhere I go, even though I gave birth to Taryn months ago. But now the 12 pounds can cry. We blessed Taryn on Father's Day. I considered the blessing a success since she came out with the name Taryn. Glad Justin didn't feel inspired to change that. My parents came to town for the occasion and made a mini vacation out of it. We did the Rose Garden, farmers market, and Washington Park. It was nice to have someone to entertain the kids besides Justin and I.
Taryn birth mark. I like to call it the "Mark of the My Little Pony." Yes, it is a heart. Macie - "Marley! Come kill this spider for me!" Marley - "Mom, can I have a mirror?" Why I asked. "Because I want to start a fire." I looked out the window and she had gathered some sticks and yard depris. I thought it was funny she didn't ask for a match. So I gave her a mirror. I wasn't too worried about her burning down the neighborhood. Trenton - "Daddy is my friend, and you are my friend and Macie and Marley." What about Taryn I asked him. "No Mom. Her is just a baby."